GraceConnect » Ahhh….Summer in Winona! 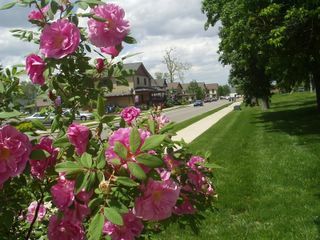 This view down Park Street, from in front of the Billy Sunday Museum looking toward the ClockTower Bakery and business district of Winona Lake,IN, is a reminder that long-awaited summer is finally coming. Last weekend Winona Lake was colorfully dotted with sailboats racing in the regatta and throngs of visitors will be coming in next weekend for the Juried Art Fair. Sigh.... What lovely flowers and on Park Street???? Nice picture and I am glad that things do change.